This project restored areas of networked native bee habitat by planting significant areas of a broad range of nectar and pollen producing native plant species, heritage herbaceous perennials and cover crop forages in a number of connected areas. Many of these are species are traditional first peoples food plants that have been pollinated by our 200 species of native bee pollinators for 10,000’s of years and thus a key to sustained food security for coastal first peoples. These plants provide realistic quantities of nectar and pollen for native pollinators and restores a very necessary biodiversity in order to meet the nutritional requirements of pollinators for sustained enhanced immune response to current and future environmental stressors. We were organized to accomplish this through timely community education, participation and engagement of all age groups in diverse venues in both urban and rural landscapes in the Cowichan Valley following the guidelines and coaching from organizations such as the very successful Xerces Society of Invertebrate Conservation. The decline of all species of bees, along with the uncertainties of climate change, significantly threatens the capacity for the sustainable pollination of food crops and native plants which define our local food culture and natural heritage. In the Cowichan Valley there is insufficient food and habitat for honey bees and native bee pollinators. This project addresses the root causes of current and future decline of honey bees and native bees by increasing the area of bee friendly urban and rural habitat essential for sustainable pollination of food crops and native plants. New research across North America and the world confirms that native bees are effective commercial pollinators when suitable habitat is adjacent to and within food producing areas. This requires needed landscape changes in urban centres and on throughout farmland to guarantee effective protection, assessment and restoration of habitat for our 200 species of native bees on Vancouver Island (450 in BC). The new research redefines the value of wild habitat in our ALR, and natural areas in BC as being essential for future sustainable pollination for long term food, seed and biodiversity security. This is especially so since our overstressed honey bees alone can no longer guarantee future pollination of food, seed and native plant pollination. What were the goals and objectives for this project? 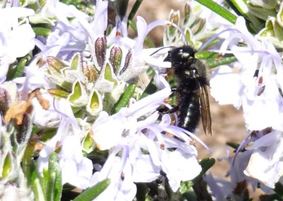 Goal 1: Increase the community’s knowledge about native bee pollinators and their critical role in the pollination of food crops and native plants. Objective: Hold at least three (3) workshops and four (4) presentations to teach the public, agricultural community and local governments about native bee pollinators and how we can help increase their effectiveness in the pollination of food crops and native plants by planting “Bee Gardens”. Objective: Attend at least four (4) community events to inform the public and general community about the importance and of native bee pollinators. Objective: Create an informational brochure, print material for workshops and publish native bee and “Bee Garden” information on our website. Goal 2: Improve bee habitat by creating and restoring “Bee Gardens”. Objective: Identify best potential “Bee Garden” sites and design layout. Objective: Collect/purchase seeds and necessary equipment and supplies for planting the “Bee Gardens” and building bee nesting boxes to be placed in gardens. Objective: Engage the community and plant the “Bee Gardens” and monitor. Goal 3: Encourage municipal and regional governments to consider bee habitat and pollinator friendly vegetation policies for land planning. Objective: Present to local government environment and planning commissions’ ideas for a new bee habitat and pollinator-friendly vegetation policy for use in municipal and regional land planning.